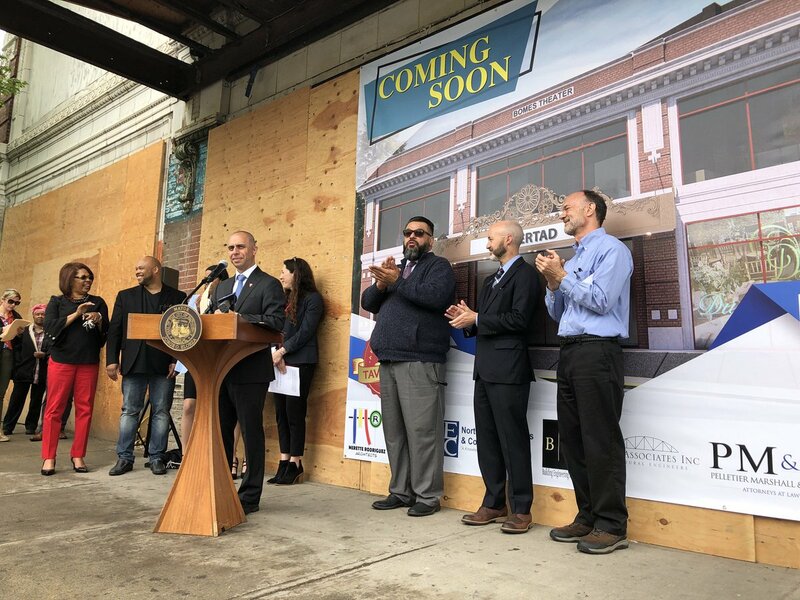 Mayor Jorge O. Elorza today joined Councilman Louis A. Aponte; Bonnie Nickerson, Director of the Department of Planning and Development; Brent Runyon, Executive Director of the Providence Preservation Society and Clark Schoettle, Executive Director of the Providence Revolving Fund to announce the transfer of the historic 1921 Bomes Theatre located at 1017 Broad Street to local developer Fernando Tavares, who will oversee the complete renovation of the theatre into a mixed-use building, which will include retail, office, and reception facility space. The Bomes Theatre was acquired by the Providence Redevelopment Agency (PRA) in 2004 as part of the Ward 9 Redevelopment Plan. The PRA will transfer the property to Tavares, LLC in exchange for his investment of $2.2 million to complete the renovation of the theatre, which will include restoration of the original exterior, rehabilitation of the theatre space into a reception facility and the creation of two new retail units and commercial office space on the second floor. Finding a use for the Bomes Theatre has been a top priority of the City, the Providence Preservation Society, the Providence Revolving Fund and other community organizations for nearly a decade. The PRA has recently worked to prepare the building for reuse by completely clearing out debris inside the building, conducting a comprehensive structural analysis of the building and enlisting a group of graduate students from Harvard University to assist in analyzing the options for the best utilization of the building and assisting in marketing the site. The Bomes Theatre had been a frequent fixture of the Providence Preservation Society’s Most Endangered Properties list and was featured in the list in 2009, 2011, 2014, 2016 and 2017. Last year, the PRA worked with Northeast Engineers and Consultants to investigate the condition of the building and analyze different options and associated construction costs for the rehabilitation of the theatre. The two-story, Beaux Arts, flat-roof, brick theater was constructed in 1921 on a lot that stood vacant in 1919 when it was purchased by Samuel Bomes. The building was one of the Bomes chain and is typical of small neighborhood theaters built after WWI, when silent picture became a popular form of family entertainment (South Providence, RlHPHC, 1978; Woodward 1986). The building was also known as the Liberty Theater when it was under the management of the Elmwood Amusement Corporation. The 1950 directory lists Liberty Theater at this address. The 1983 Sanborn map notes that the theater had a capacity of 865 persons. Following its use as a theater, the building was occupied by Jason’s Furniture.